Sat., Dec. 31, 2016, 11:15 p.m.
Laura Stockton has made that shot before. And surely will again. But not on Saturday afternoon. With the Gonzaga women down by two to Pacific at the Kennel, the ball found its way to the Bulldog guard on the left wing with two seconds left. 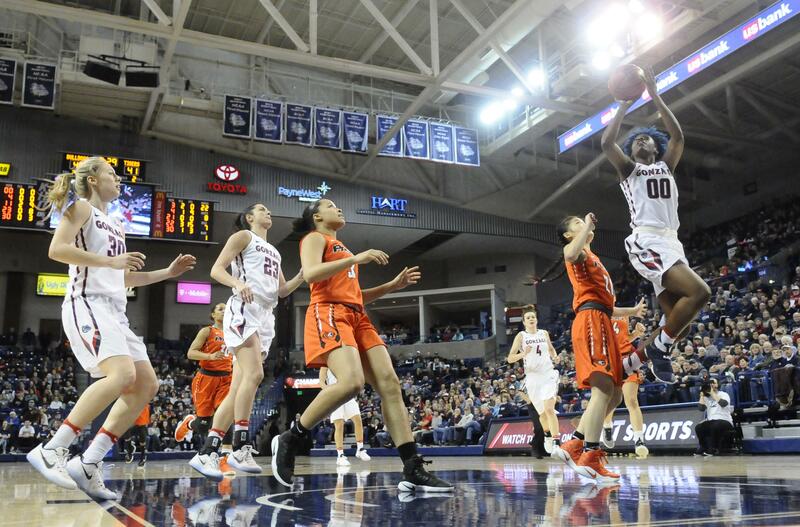 Her feet just outside the 3-point arc, a wide-open Stockton let fly with a potential game-winner, but hit the iron and the Zags lost their second straight West Coast Conference game, 65-63. Perhaps it shouldn’t have come to that, as Gonzaga had a nine-point lead late in the third quarter. But the Tigers went 9 of 14 from the field in the fourth quarter to send the Zags to their first 0-2 start in WCC play since Kelly Graves’ first season back in 2000-01. To their credit, the Bulldogs (9-4) corrected the rebounding deficiencies from Thursday night’s loss at Pepperdine, owning the boards 39-32 against Pacific. However, they allowed the Tigers (6-7, 2-0) to shoot 47 percent from the field. At the other end of the court, Gonzaga shot 2 of 15 from beyond the arc. That came on the heels of a 5 of 28 effort at Pepperdine. Instead, Pacific seemed to force the pace most of the afternoon in front of a crowd of 5,812. The game couldn’t have started any worse for the Bulldogs, who missed eight of their first nine shots and turned the ball over nine times in the first quarter. By that time Gonzaga trailed 13-7. It could have been worse, but Pacific missed six of its last seven shots in the period. Still, it was the first time this season that the Bulldogs failed to get into double digits in a quarter. Pacific stretched the lead to 21-7 on back-to-back 3-pointers, including one by Tylah King that struck the back iron but popped into the air and back through the net. It was that kind of quarter. Gonzaga hit low ebb with 3 1/2 minutes left in the half, as Emily Simons stole the ball from Jessie Loera in the backcourt and took it the other way for a layup. That gave Pacific a 30-16 lead, but GU scored the last eight points of the half to get back in the game. Stockton led the rally with an assist, a steal and two layups, the last with two seconds left. Gonzaga carried the momentum into a golden third quarter, outscoring the Tigers 22-12 and taking the momentum. And the game, it seemed at the time. With the Zags leading 43-34 late in the third quarter, the visitors called timeout. A video showed several Bulldogs sharing their New Year’s resolutions. Coincidentally or not, the tide turned at that point. Pacific scored five straight points to end the quarter and slowly got back in the game. The last seven minutes were nothing but one-possession drama. Jill Barta got the last of her team-high 15 points on a free-throw that put Gonzaga up 61-60 with 1:41 to play, but Pacific answered. “Their offense is better than our defense,” Fortier said. Gonzaga regained a 63-62 lead on Stockton’s jumper with 1:05 left, but eight seconds later, the Tigers got a fastbreak layup and free throw from GeAnna Luaulu-Summers for what turned out to be the winning score. Published: Dec. 31, 2016, 11:15 p.m.